By 8am I was in the water and ready to start, it was not nearly as cold as I thought and the majority were going without a wetsuit. Just before the start I asked someone exact where the finish was as there were no buoys in sight, I was then pointed to a small orange dot in the distance at the far side of the lake, with the advice of just using the mountain to sight from. The swim started with 300+ swimmers with a wide starting line from beach, it was a little crowded at the beginning but nothing as bad as the beating you get at the start of a triathlon. My goal was to keep a consistent pace and keeping swimming the whole way. For a while at the beginning I was near a kayak which was helping lead the swimmers, this stopped me from making any wrong turns and helped with the pace. With the lake being very long and wide the pack spread out and after the first mile I left like was all alone. Now a pessimistic person would start to think everyone else had finished already and that they were the last remaining swimmer, while I not the best swimmer thought didn't even cross my mind. Instead I took the optimistic approach and pretended I was leading the pack and having the best swim of my life, there is nothing better than a positive attitude to keep you going strong. However the best will in the world can not prevent the occasional issue, firstly I got a cramp in my leg, staying relax and let it gradually ease away did the trick through it slowed me down. Secondly at around 2 miles into the swim I found really need to pee and was becoming uncomfortable (here is the part of the story where I let people use their imaginations of how I resolved this). Needless to say I kept going with a couple course corrections as I finally sighted the finishing point. With just merely 500 yards to go, two people came out from know where and swam by me. I picked up the pace a little and started kicking more to get my legs ready for the land. I ran out of the water very nearly stumbling and landing flat on my face, my time was 1hr 41mins on clock. The views were striking, and my heart rate was raising along with the elevation, tried to take the ride easy and was very cautious on the decent. I completed the ride with a loop around the other side of the lake. 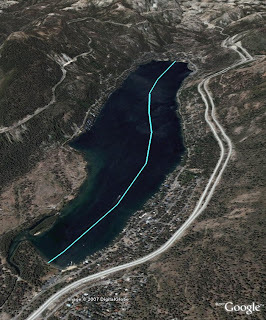 While it was a short ride the swim was worth the trip up to Donner Lake.